Some of the shiny taps at Mikkeller Bar. Photo: © tablehopper.com. The illustrious Camper English at Alcademics has a nice scoop about what’s moving into the former Tokyo Go Go space: ~ABV~. The project is from Erik Reichborn-Kjennerud (who owns Dalva/Hideout), Ryan Fitzgerald (known for his skills when he was at Beretta and who is currently the brand ambassador for Del Maguey mezcal), and Todd Smith (who rocked it at Bourbon & Branch and will presently get you tipsy at Hideout). The gents are going to be staying away from cocktail trends (no barrel-aging or drinks on draft, and no Edison bulbs), offering 10 to 15 drinks. There will be food as well, with a kitchen serving bar bites until 1am (everything should be priced around $10 and under, drinks included). There will also be classes, theme nights, and some ideas are sure to pop up in coming months. Look for a January opening or so. 3174 16th St. at Albion. 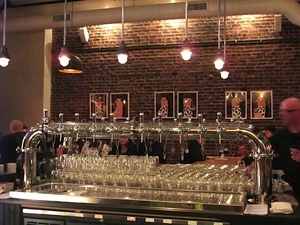 ~MIKKELLER BAR~ has opened their downstairs sour room: the Tivoli Sour Room. Eater mentions the room has room for 20, and is pouring exclusively lambics and sour beers, with 80 bottles. You can park it at the communal table or there are a couple of two-tops. Open Thu-Sat 6pm-2am; otherwise you can rent it for private parties. 34 Mason St. at Turk, 415-984-0279. A couple of weeks ago, I broke the news that Ceri Smith was going to be the wine director at the soon-to-reopen ~TOSCA CAFE~, but I was told to keep quiet about the second component: that she was going to be working with Randall Grahm. Scoop has an interview with the duo about their partnership, and also revealed the new bar manager is Isaac Shumway (previously Alembic, Bourbon & Branch, and Heaven’s Dog), who will be updating some classic cocktails, including making some tweaks to the House Cappuccino. White jackets will continue to be de rigueur behind the bar. 242 Columbus Ave. at Broadway.